PORT ST. MAARTEN – Cargo operations at the Captain David Cargo Quay have resumed after a side scan sonar was carried out of the seabed to see if there were any underwater obstructions. 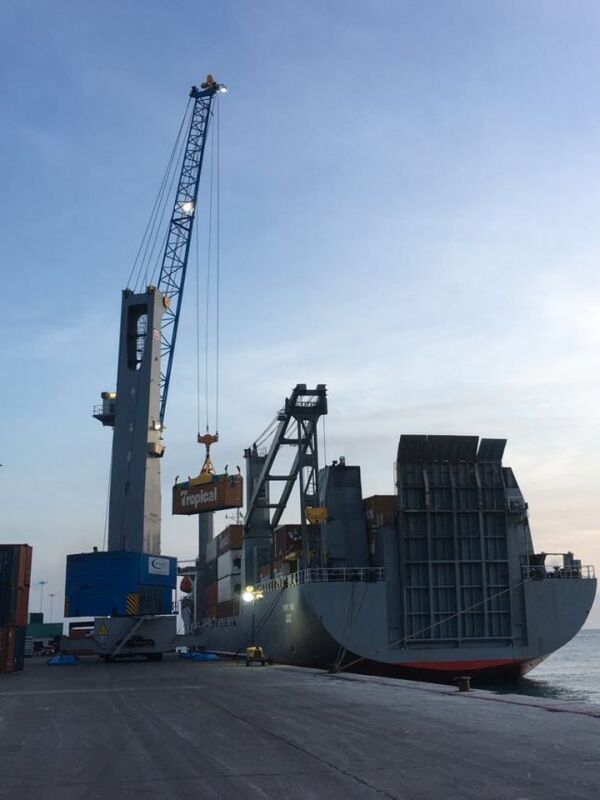 Over the weekend the Model 6 Mobile Gottwald Harbor Crane was back in operation offloading containers from Motor Vessel Tropic Sun. The assessment was carried out after the passing of Maria and there was no additional damage to the nation’s port facilities. It was confirmed by the Port Maritime Department that the water depth remains the same at the quay and there was no visual debris on the seabed to obstruct safe passage of vessels. Hurricane Maria passed to the south of Sint Maarten on Tuesday into Wednesday, September 19/20. Sea conditions in Great Bay remained rough up until and including Friday. The Captain David Cargo Quay is open for relief aid and supplies, but also building supplies and commercial cargo which are essential to the rebuilding effort. The safe berthing of vessels has commenced. The cargo quay is 540 meters long with a water depth of 10.5 meters, and houses up to 3,000 teu-containers at the quay’s storage area. Port St. Maarten discontinued cargo operations at 6.00 PM on Monday, September 18. Personnel at the port activated their hurricane preparations plans in order to protect the facility, cargo and buildings due to the approach of Hurricane Maria. Requests have been received from private consignees for the importation of goods, and Port St. Maarten’s Management advises that the aforementioned should follow-up with their usual cargo agents to regulate the aforementioned. U.S. cargo to be sent to the island as normal are to be shipped via Tropical Shipping, King Ocean and Seaboard Marine Line. European cargo bound for country Sint Maarten normally is shipped via CMA-CGM and Seatrade StreamLines, and arrangements should be made via those companies with their respective local agencies.